I am in Kuala Lumpur, Malaysia, attending the Resilience 2011: Asia Regional Conference on Building Livelihood Resilience in Changing Climate, being held from 3 – 5 March 2011. The conference brings together researchers and practitioners from three fields: Disaster Risk Reduction (DRR) and disaster management community; Ecosystem services and conservation community; and the livelihoods and socio-economic development community. Although their work overlap part of the time, they don’t converge too often. I will blog on different aspects of the conference, trying to connect the dots, and relating the micro to the macro as I often do in my own work communicating development. There are many issues, topics and discussions under the broad theme of protecting Asian livelihoods from climate change impacts. 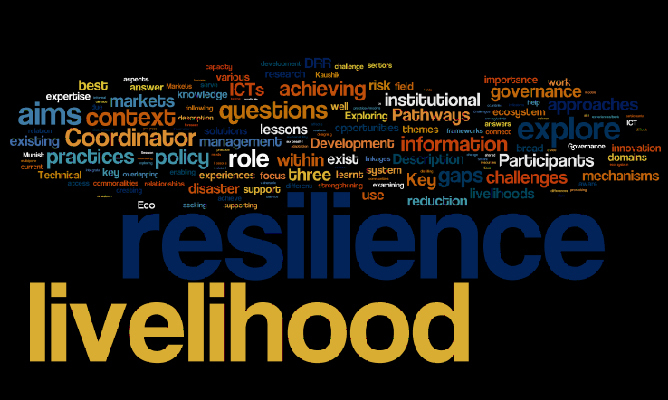 For a start, I used Wordle to build a word map, displaying proportionate use of keywords in the conference sessions. The above and below are the word clouds it generated (same words, displayed in different modes). The conference is organised jointly by Wetlands International-South Asia (WISA), International Development Research Center (IDRC), The Climate and Development Knowledge Network (CDKN), Cordaid and ekgaon technologies of India.